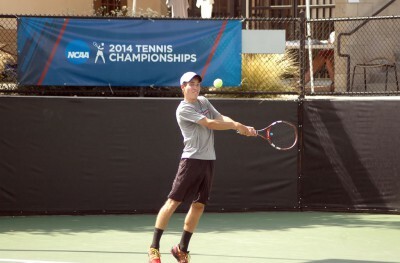 Jacob Yasgoor ’17 was named the ITA West Region Rookie of the Year for the Men’s Tennis team. Paul Messana ’17 of Men’s Track and Field earned the SCIAC Newcomer of the Year award after a dominant first season that saw him go undefeated in the 800 meters against Division III opponents and earn an invitation to the NCAA Division III National Championships this week. Messana, who ended up with the 15th fastest time in Division III during the regular season, will compete at nationals in the prelims on Friday at Ohio Wesleyan, and will then run in the finals on Saturday if he advances. Men’s Tennis saw Jacob Yasgoor ’17 earn the Intercollegiate Tennis Association (ITA) West Region Rookie of the Year award after an impressive first year season playing at No. 2 singles for the Sagehens. Yasgoor and Christopher Wiechert ’14 were also both named first-team All-SCIAC with Wiechert (the ITA West Region Rookie of the Year in 2011) earning first-team all-SCIAC for the fourth time in his career. Women’s Lacrosse and Softball also had All-Region honors announced this week by the Intercollegiate Women’s Lacrosse Coaches Association. Jana London ’14 was one of four Sagehens to earn first-team All-West Region, earning the honor for the second time in her career. Ashley Morello ’15, meanwhile, was named third-team All-West Region by the National Fastpitch Coaches Association (NFCA), making her only the sixth player in program history to earn all-region accolades.